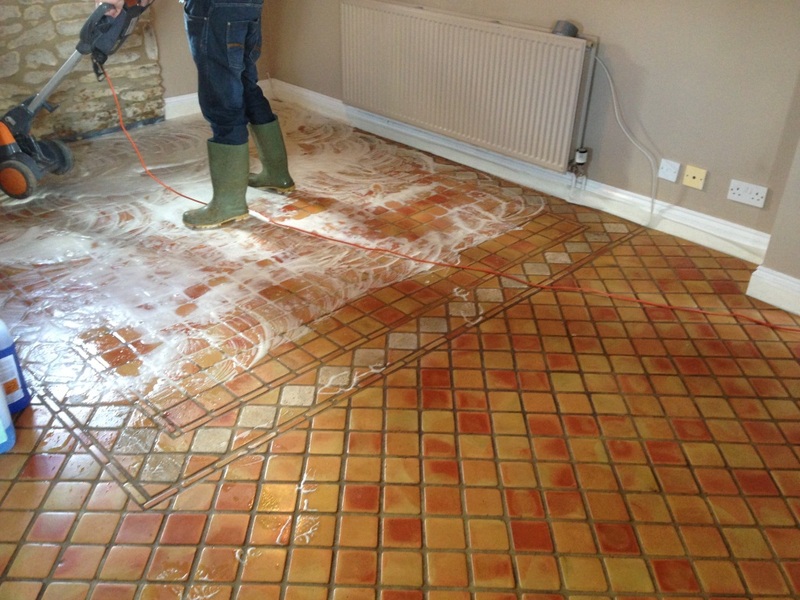 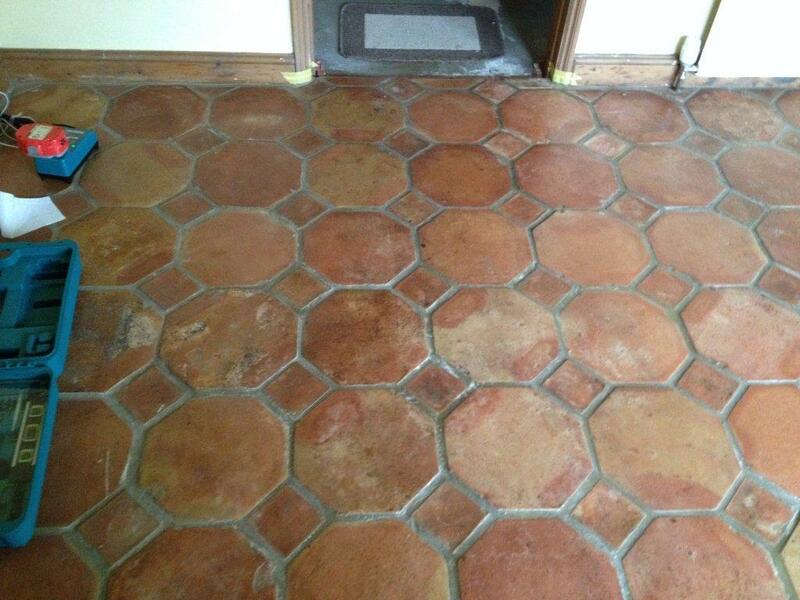 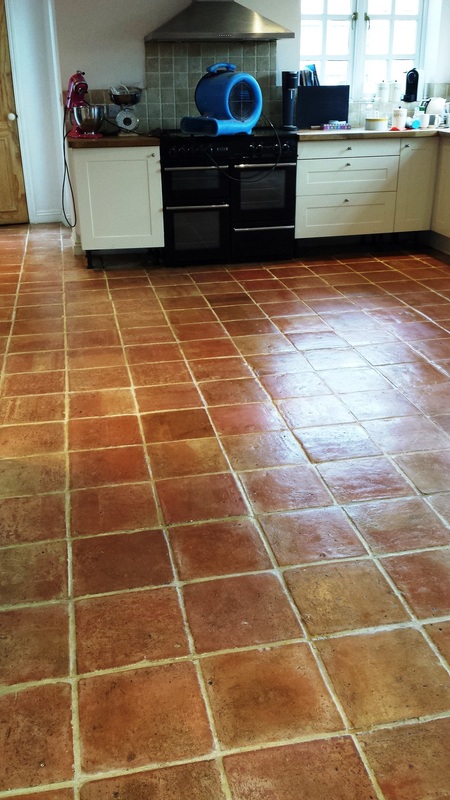 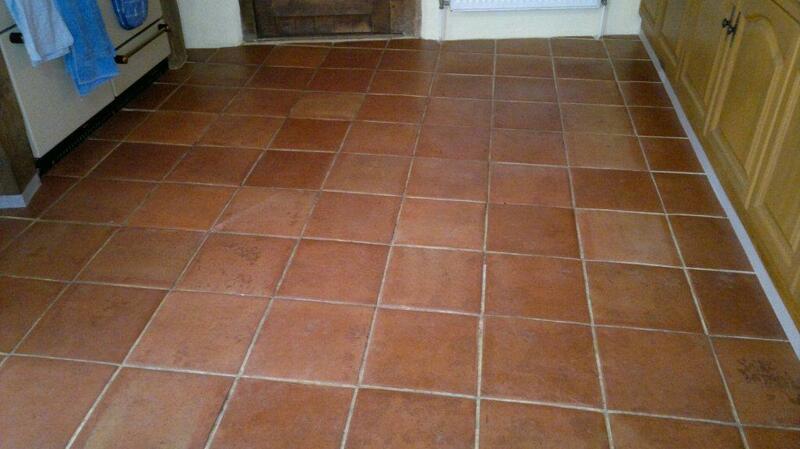 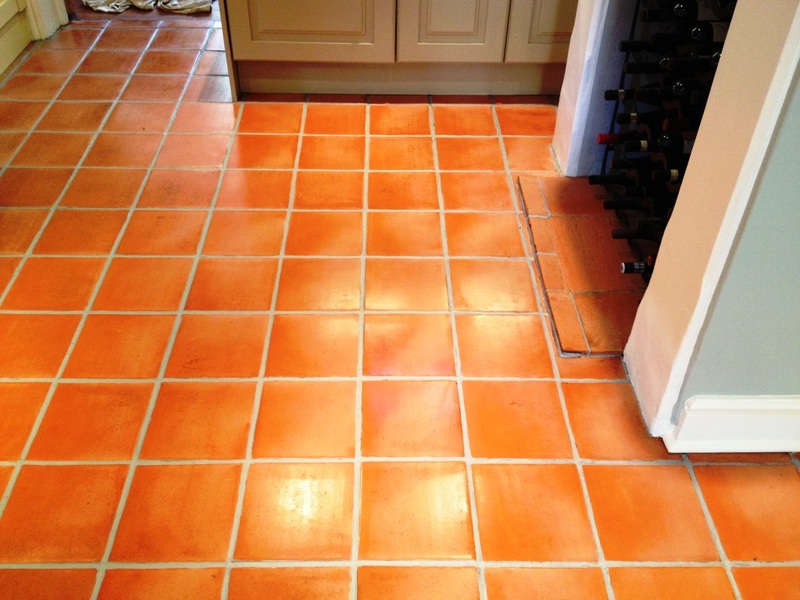 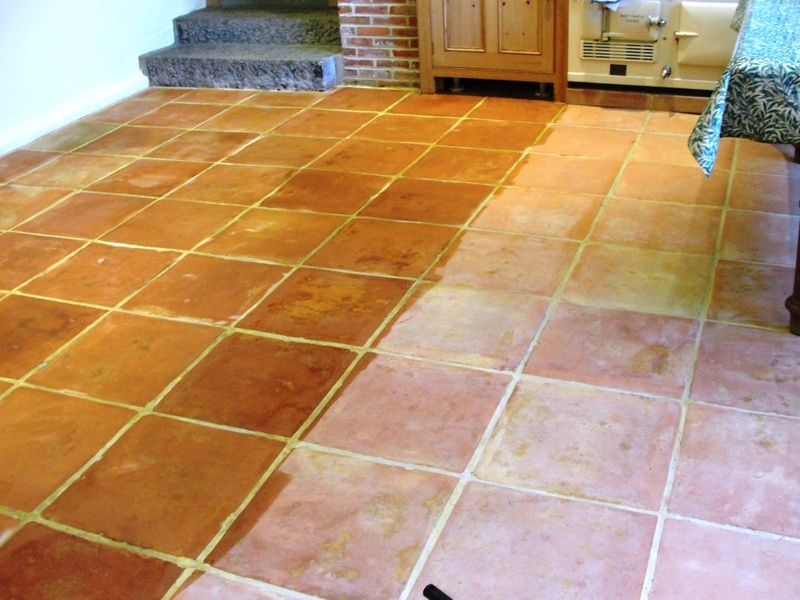 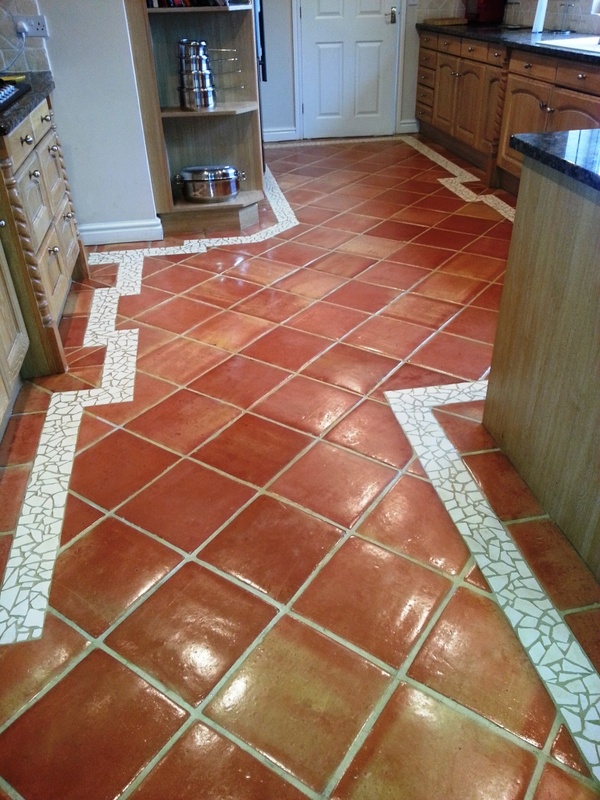 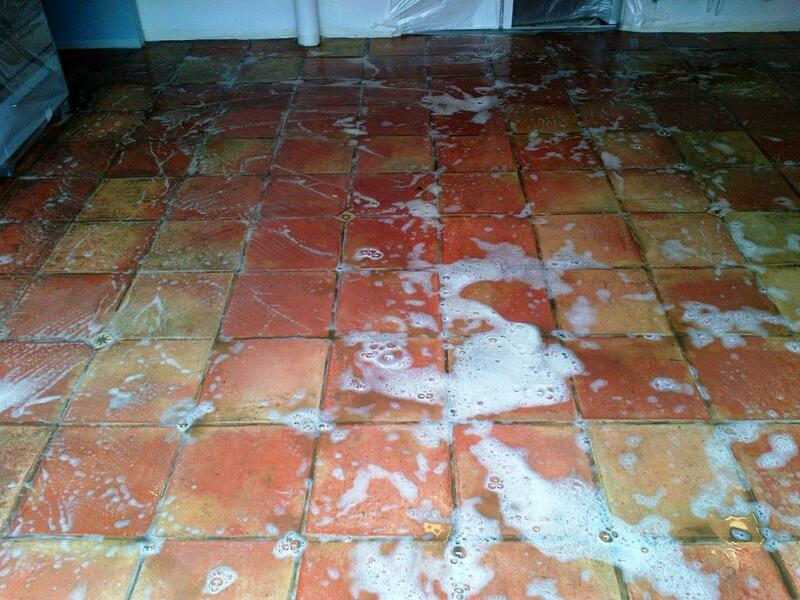 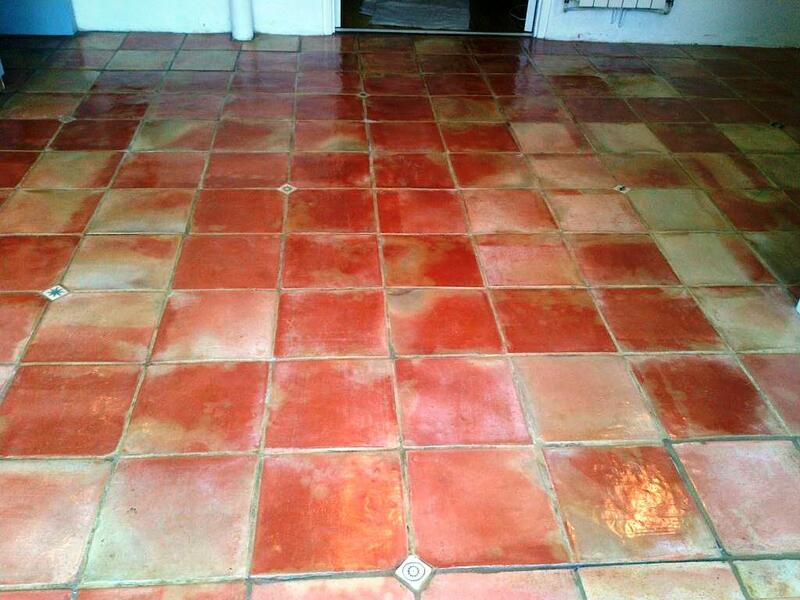 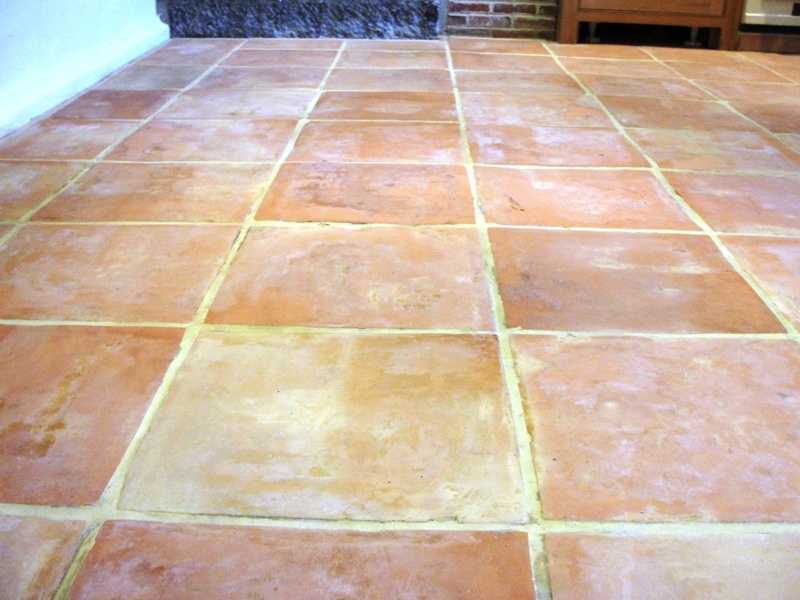 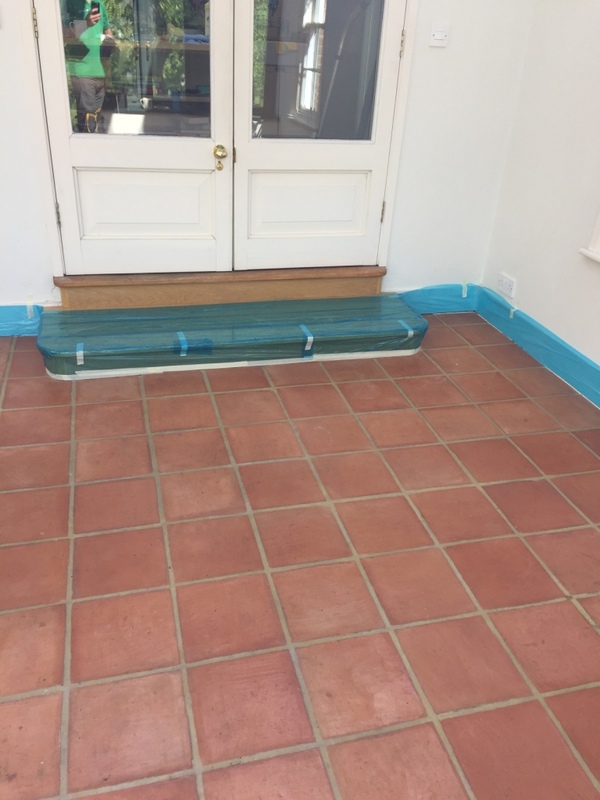 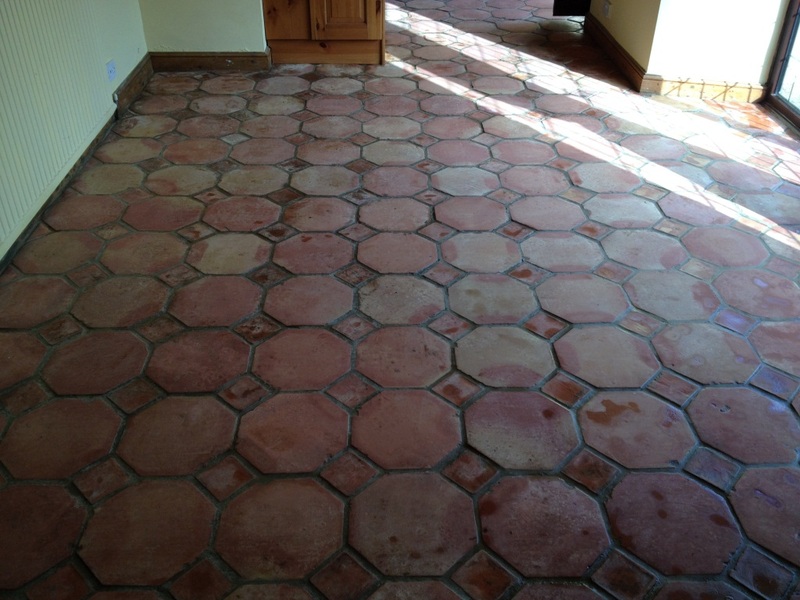 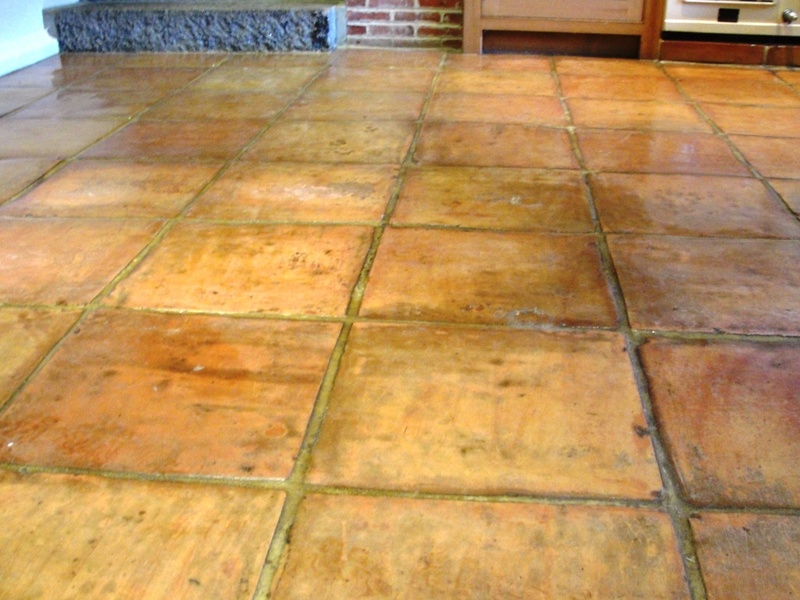 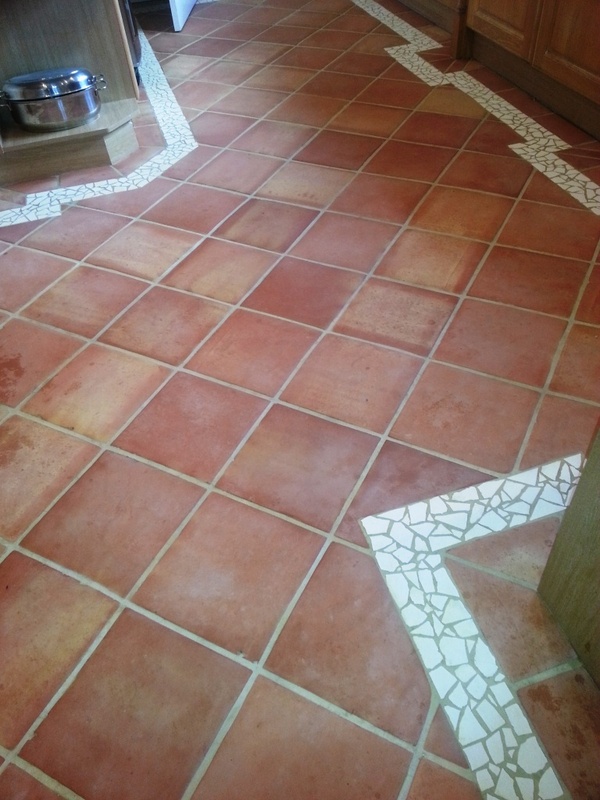 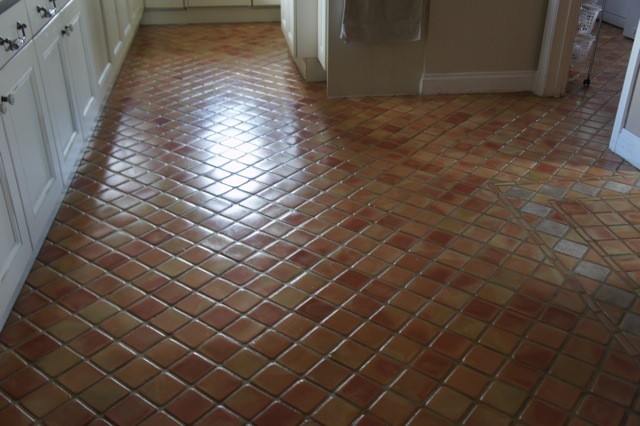 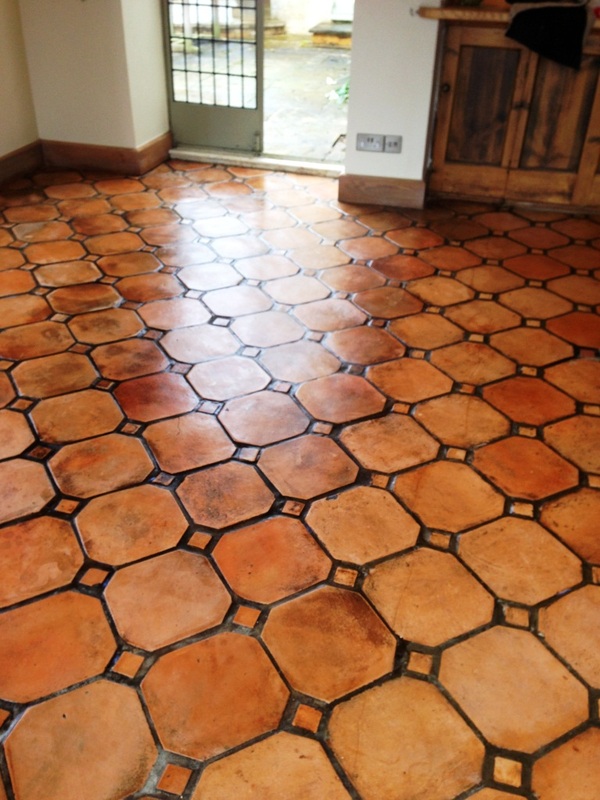 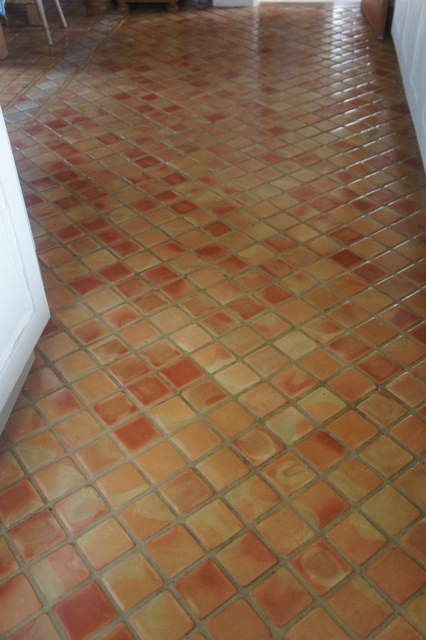 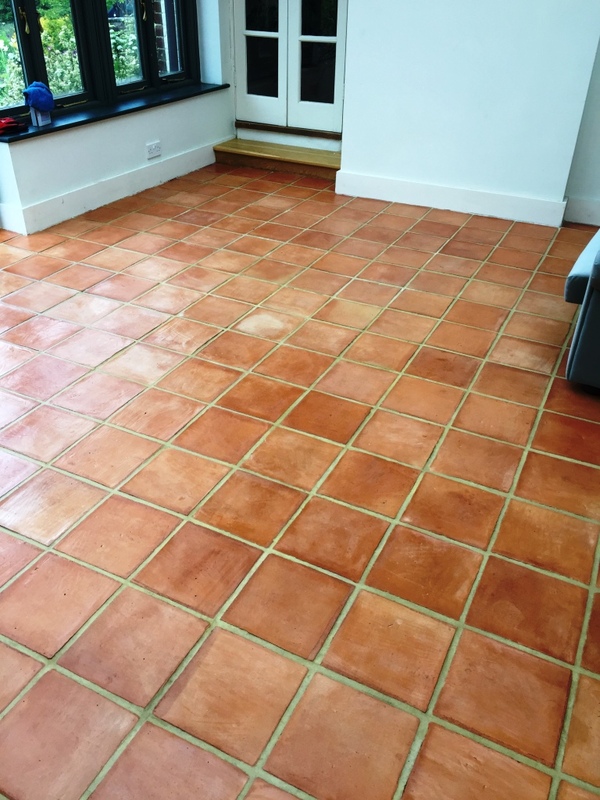 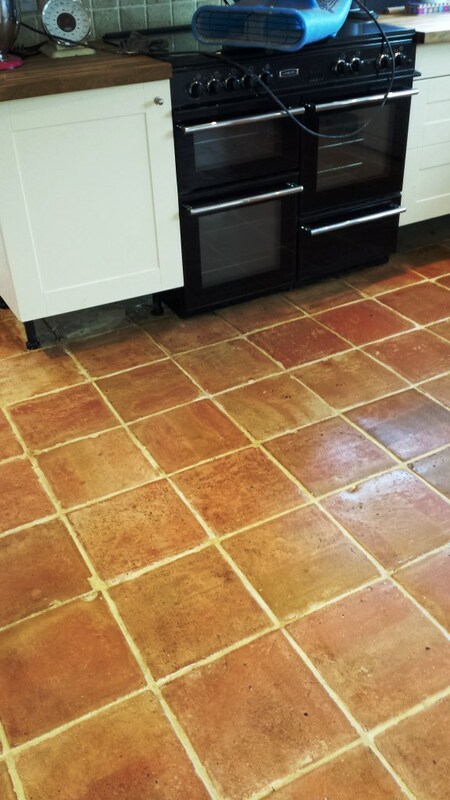 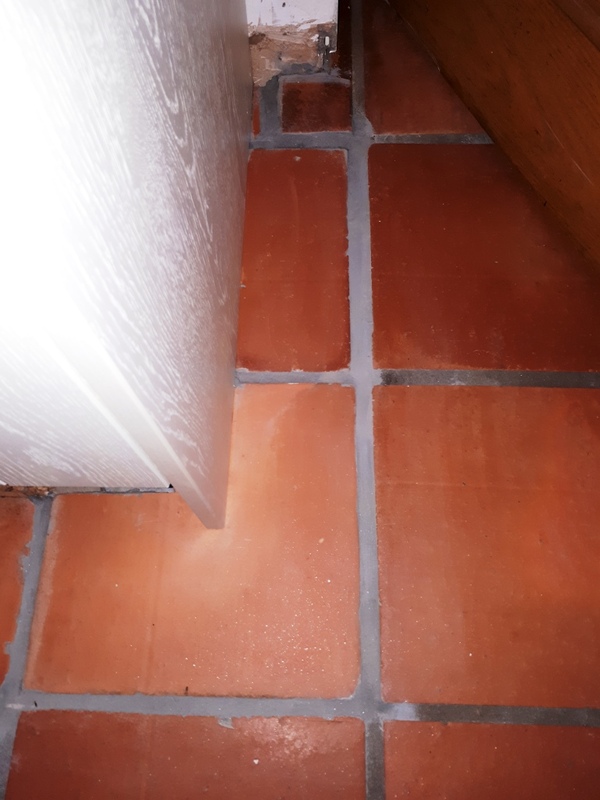 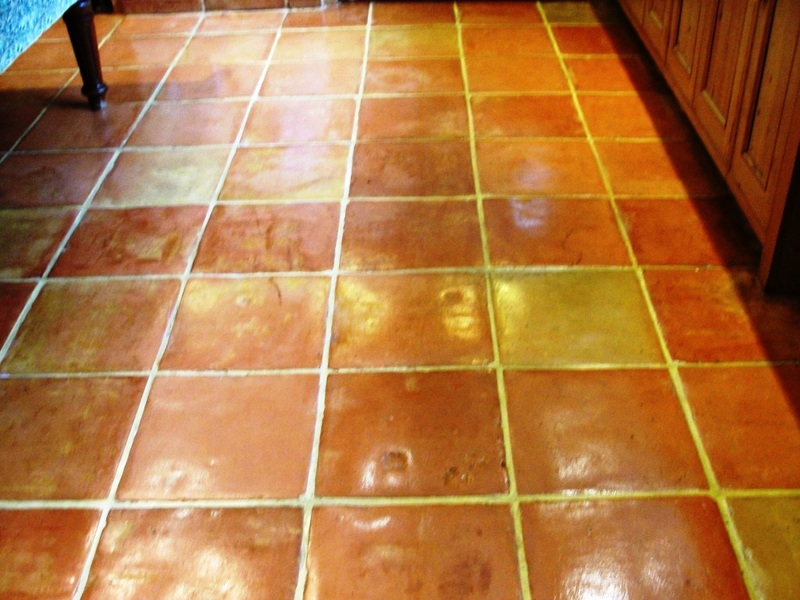 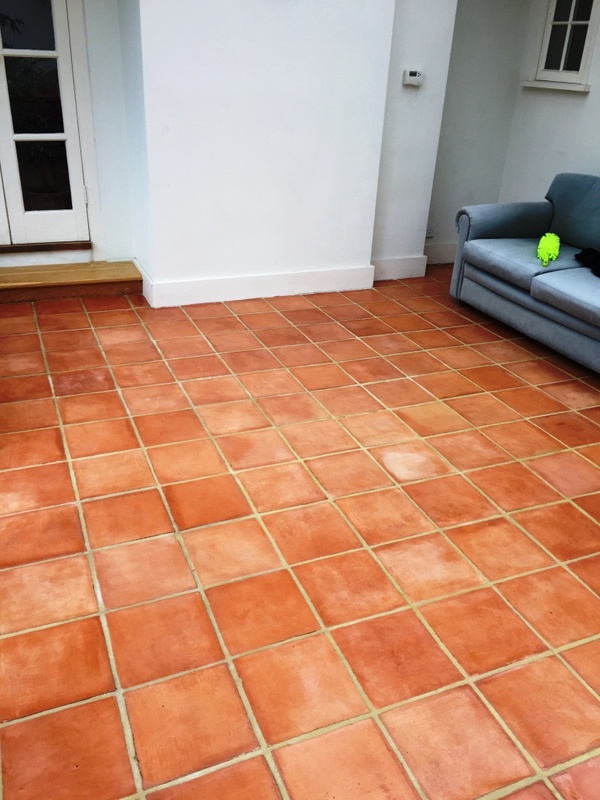 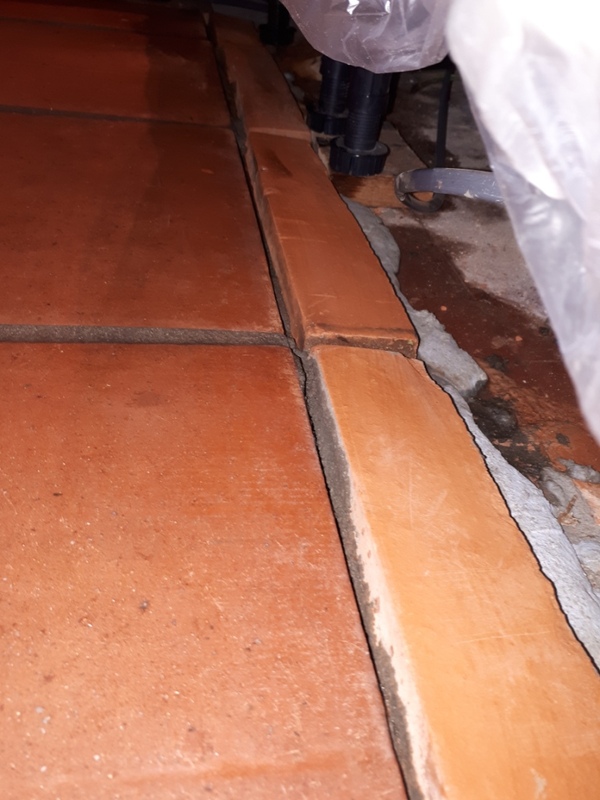 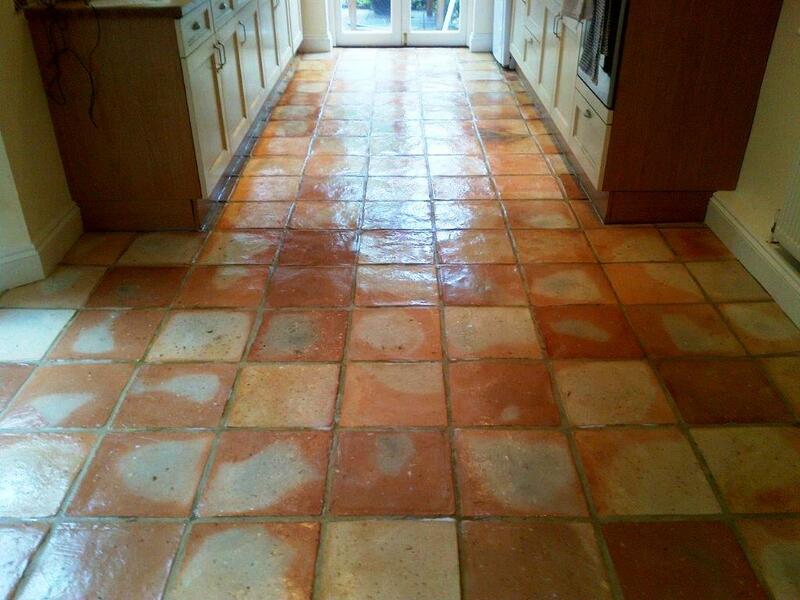 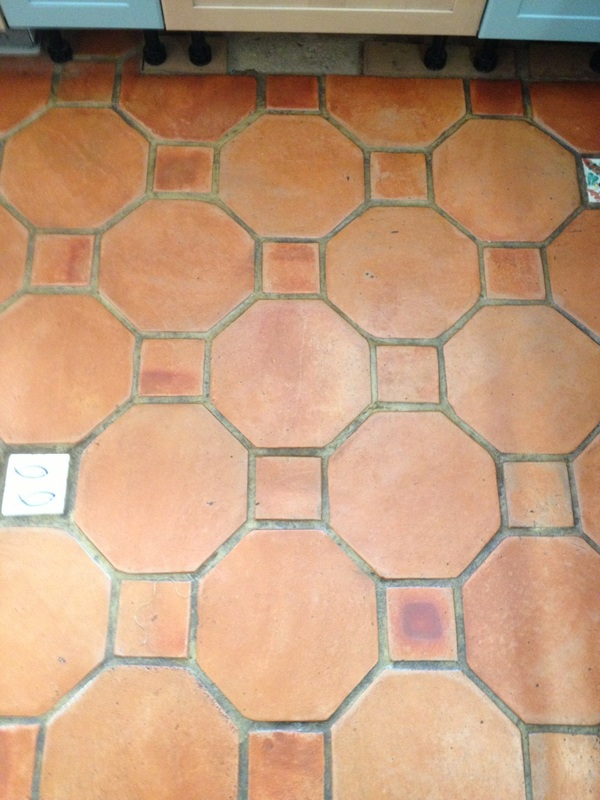 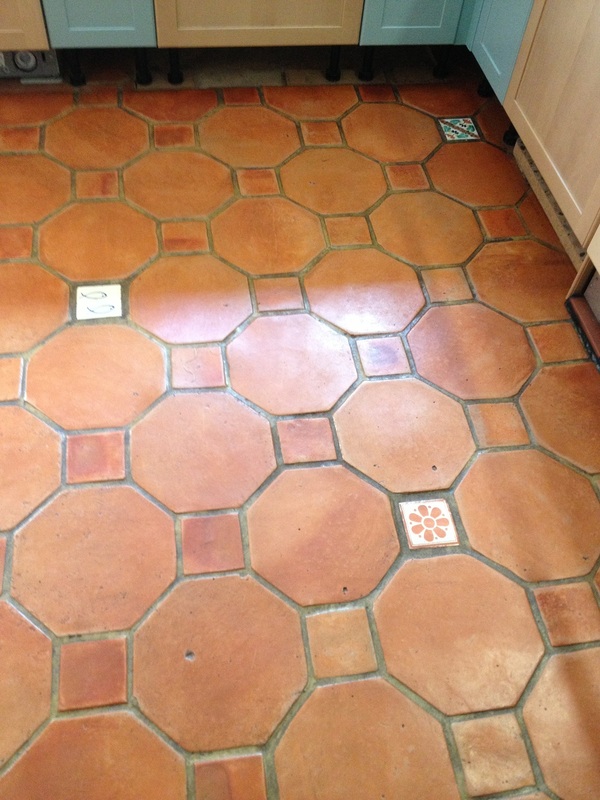 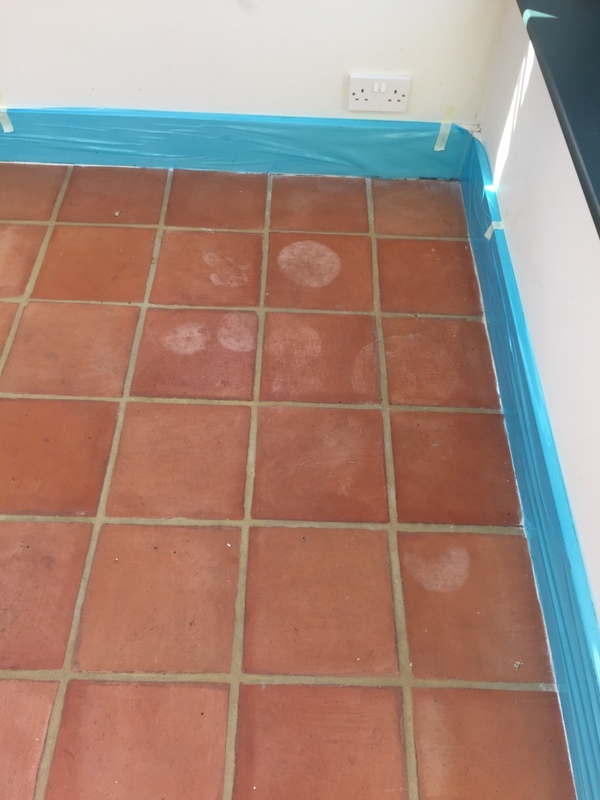 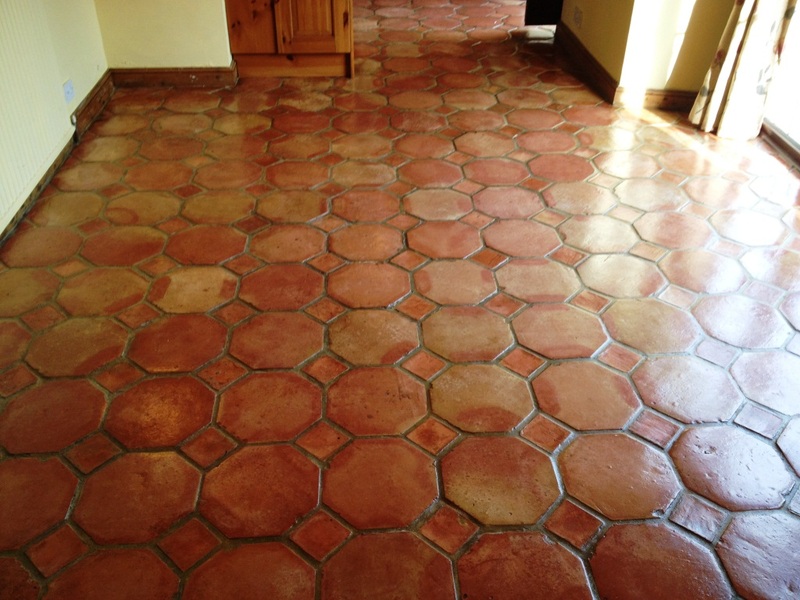 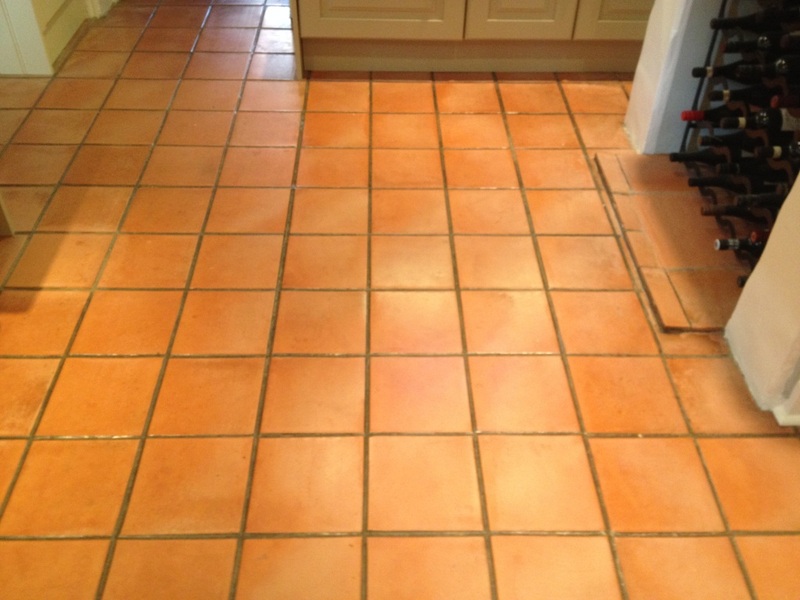 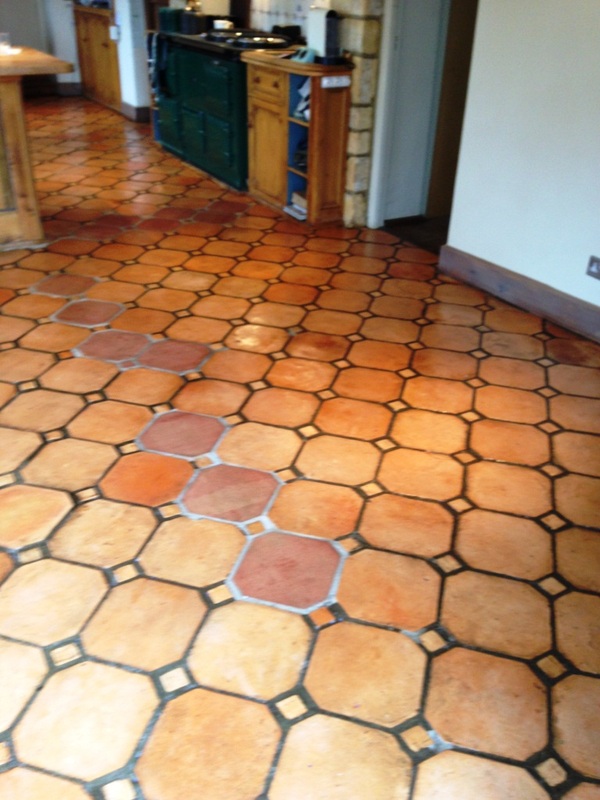 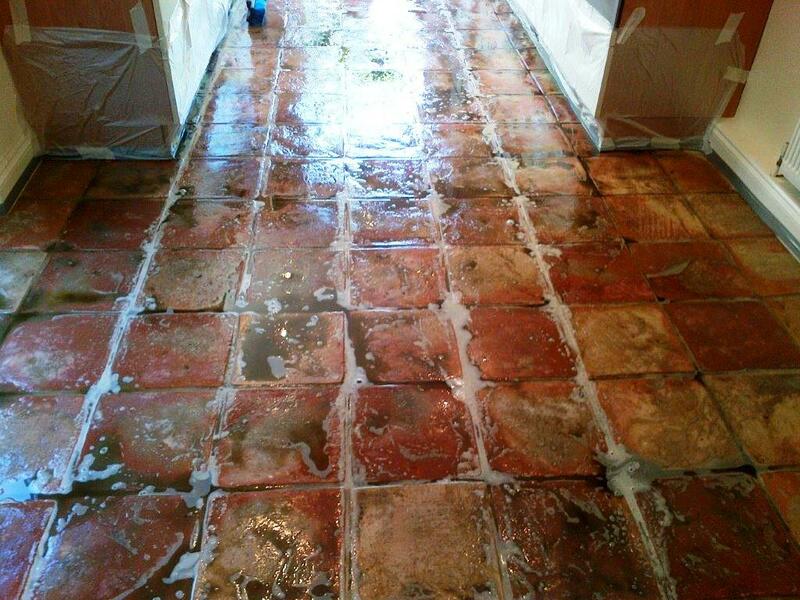 This terracotta floor installed in a house in Denham, at the southern end of Buckinghamshire, had become discoloured with ingrained soil and a mix of old sealers and wax coating leaving an unsightly looking kitchen floor that was in need of stripping, deep cleaning and reseal. 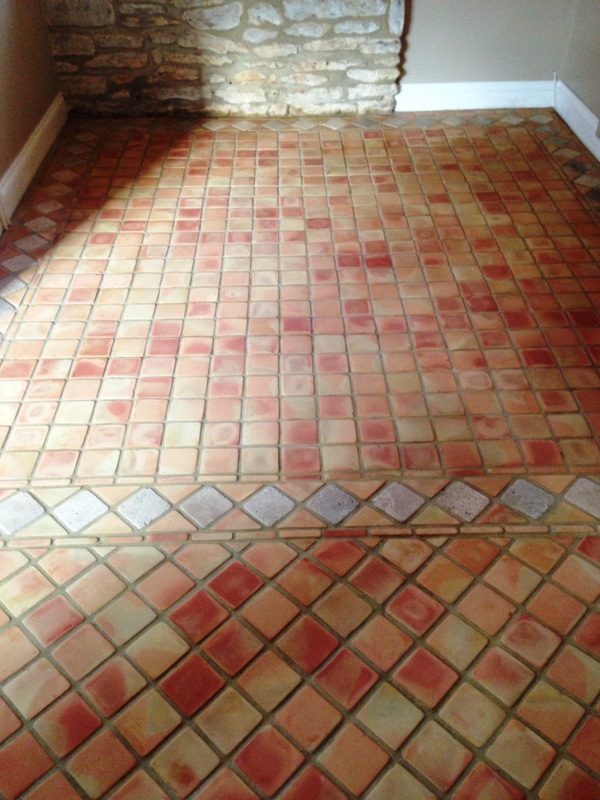 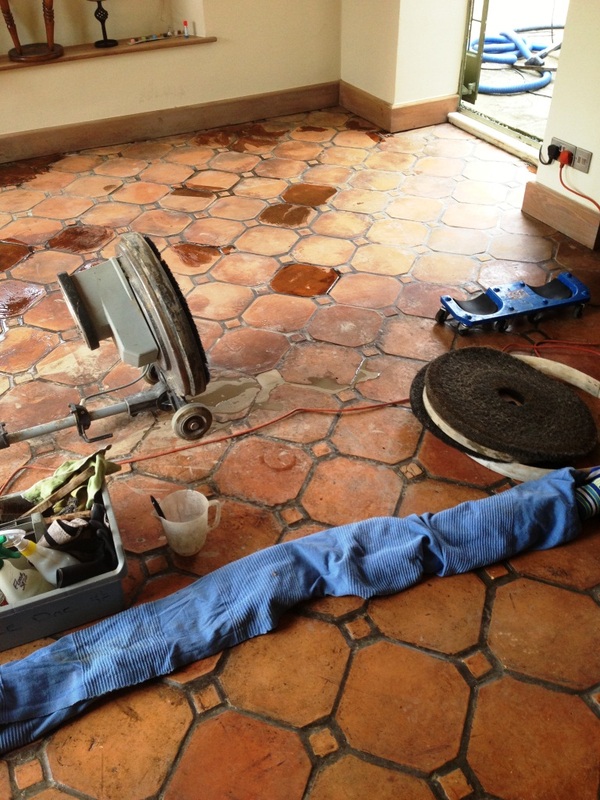 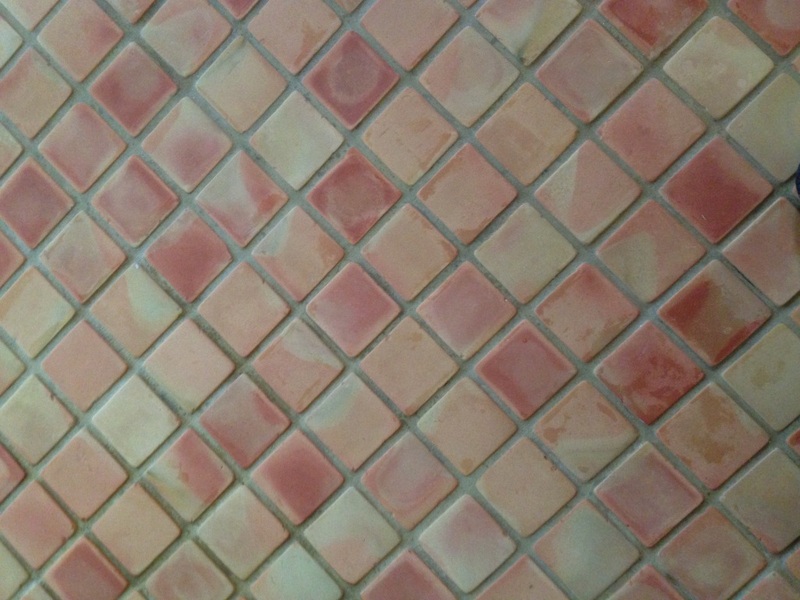 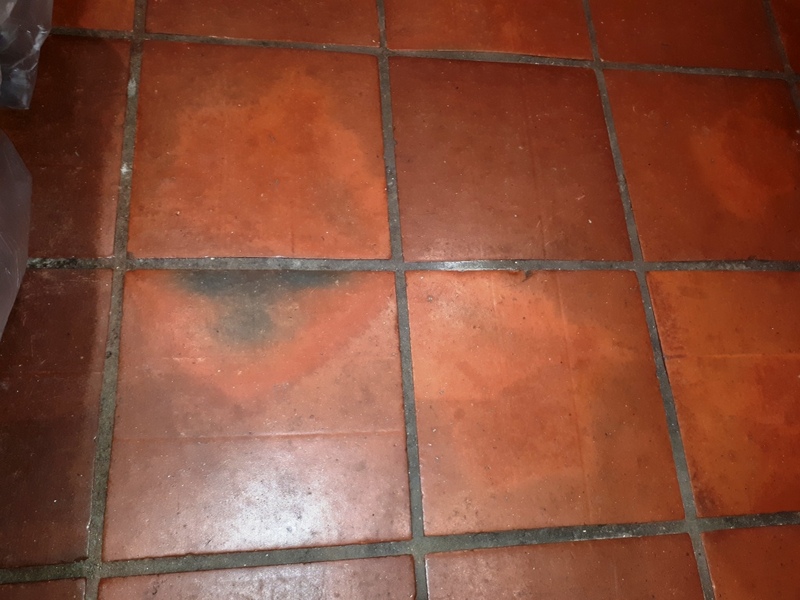 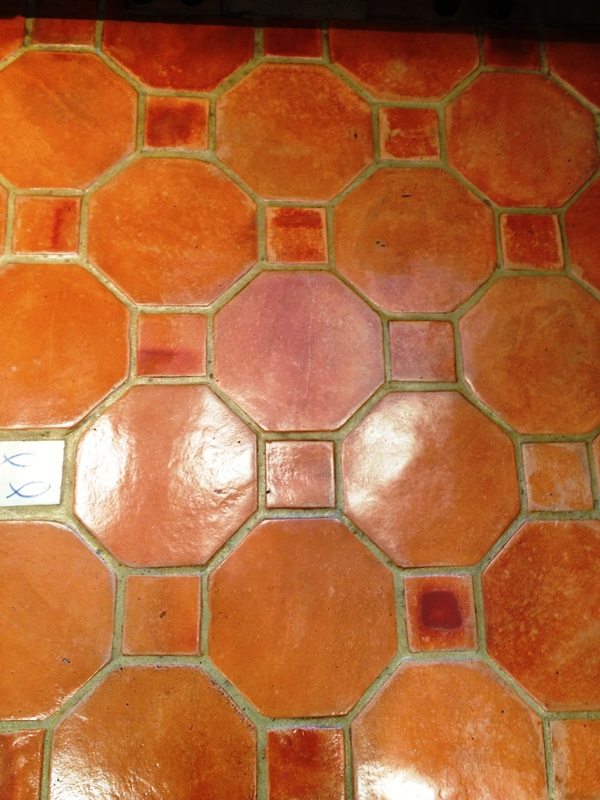 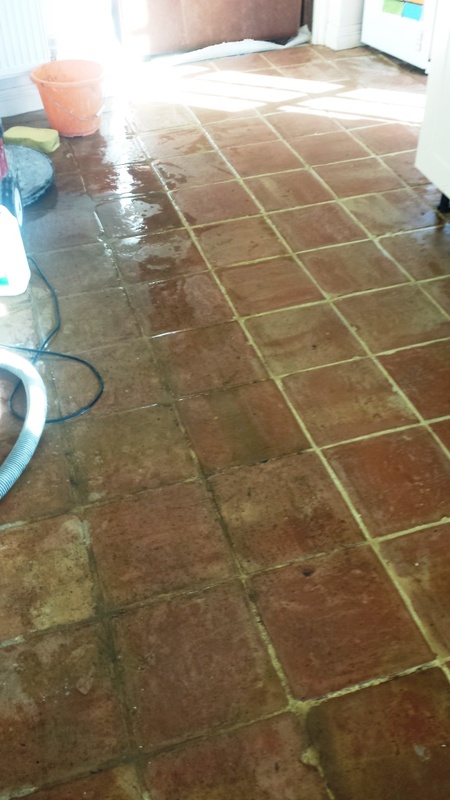 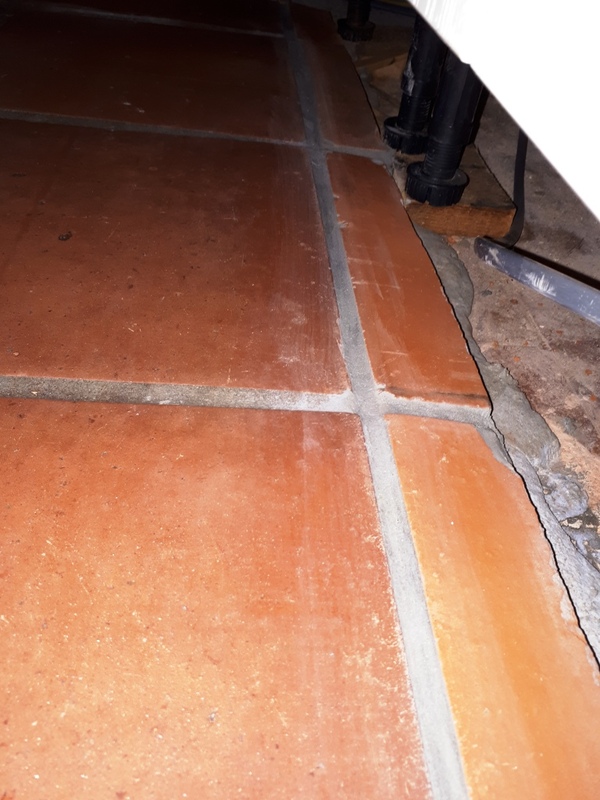 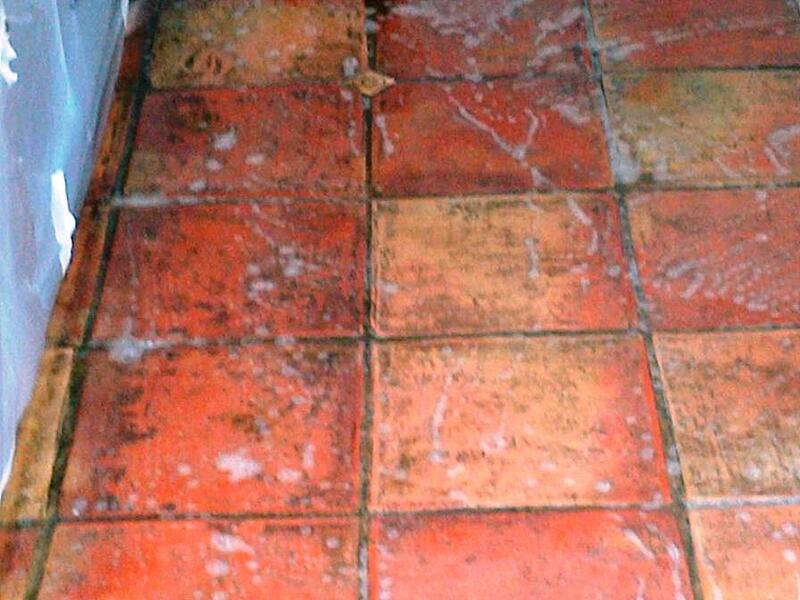 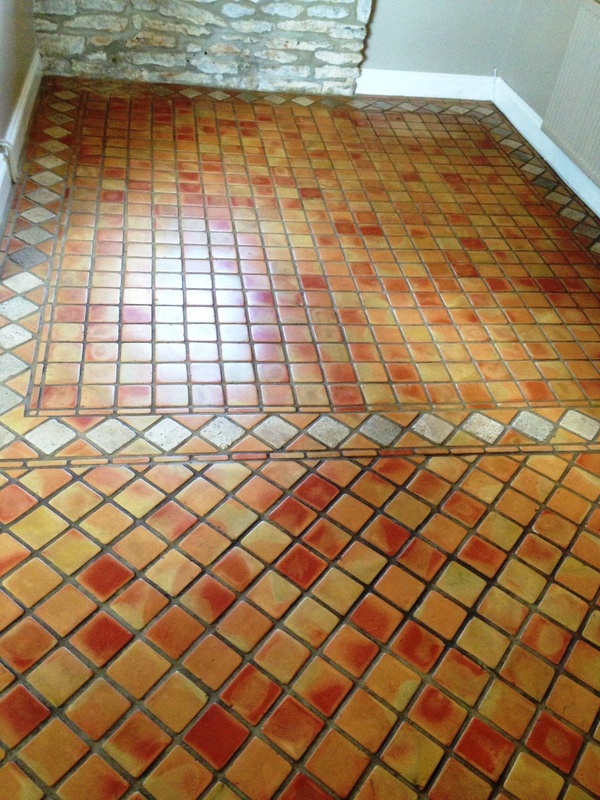 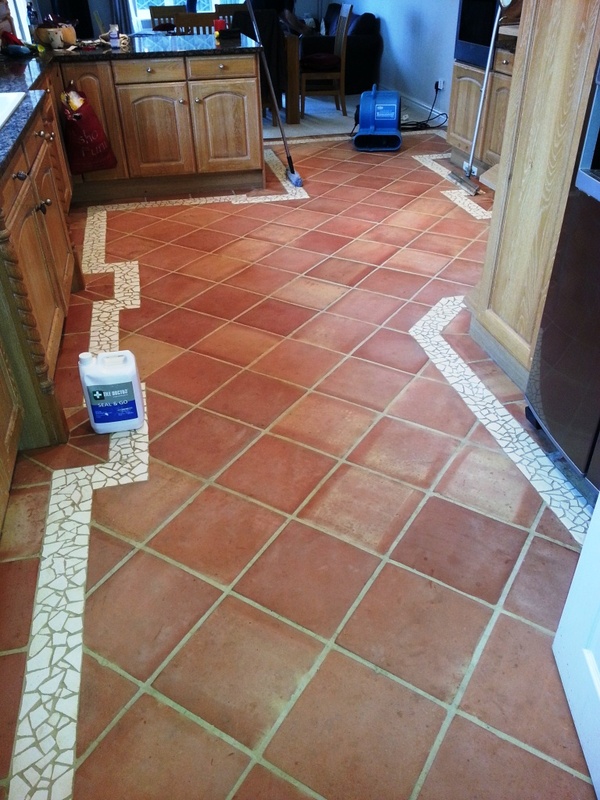 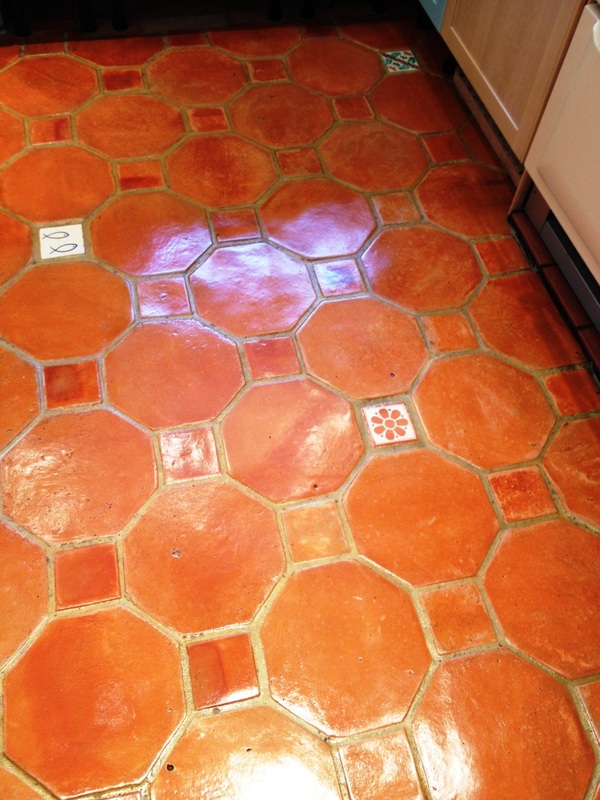 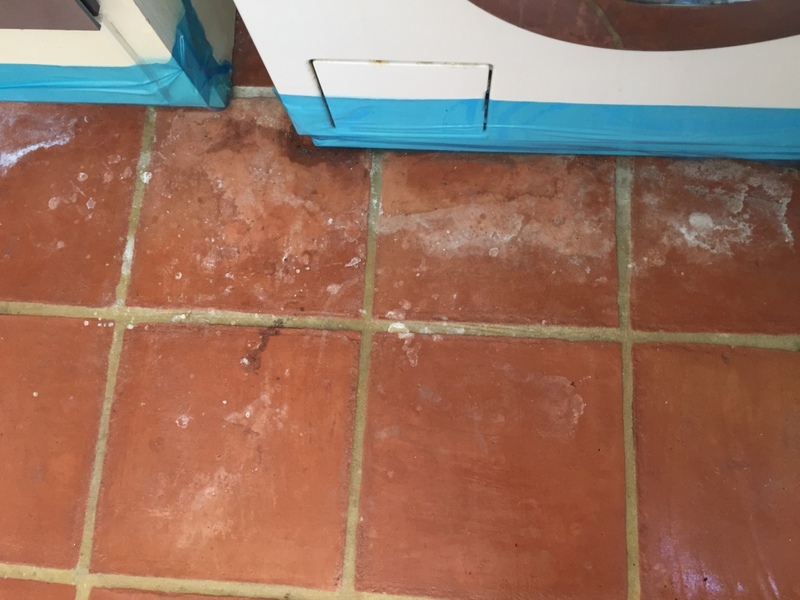 I started the job using a solution of Tile Doctor Pro-Clean, which is a heavy duty alkaline product ideal for cleaning natural products such as Terracotta; this was scrubbed into the tiles quite aggressively with a black pad fitted to a rotary machine on slow speed. 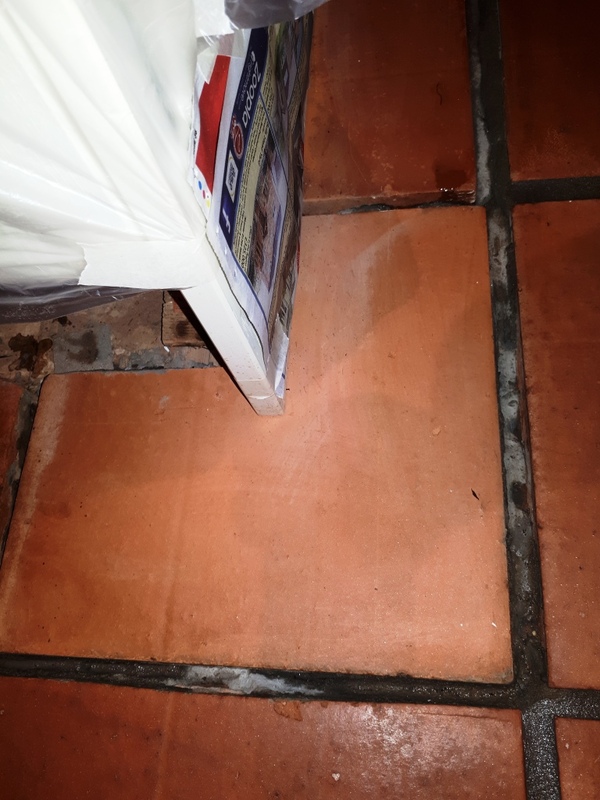 Once this had been completed we could see the remaining old sealers and wax layers and started to remove them using a strong tile stripper called Tile Doctor Remove and Go. 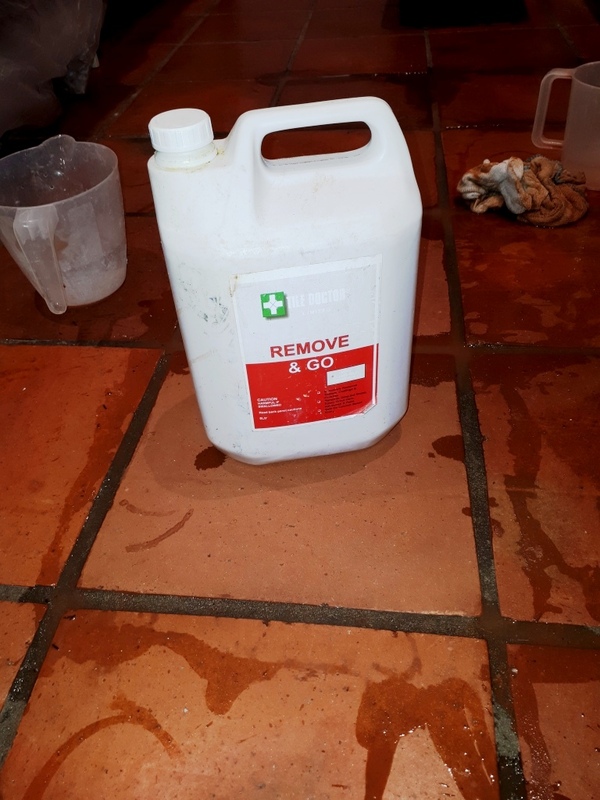 Once we were satisfied we had removed all of the coatings we gave the floor a thorough rinse with clear water to remove any remaining residue and left it to dry overnight. 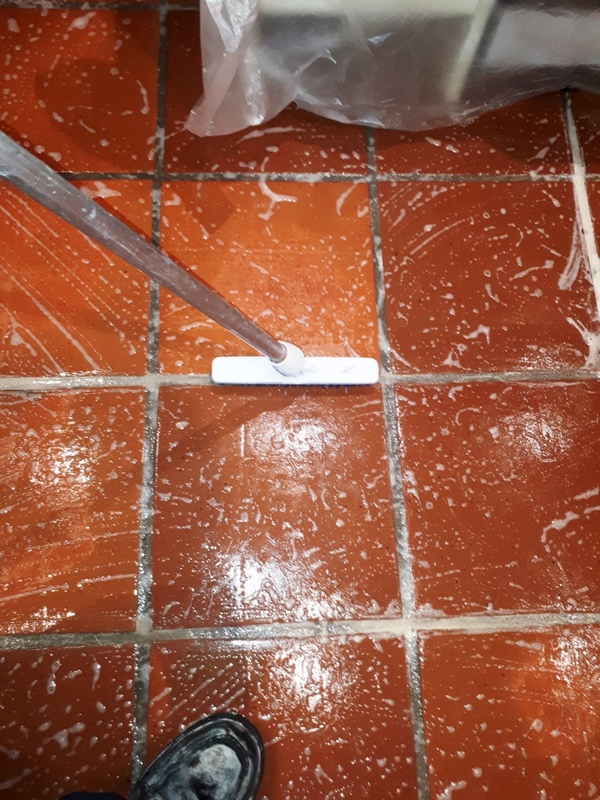 The next day came back to do the sealing and checked the floor first for any spots we might had missed and also to ensure it had dried sufficiently. 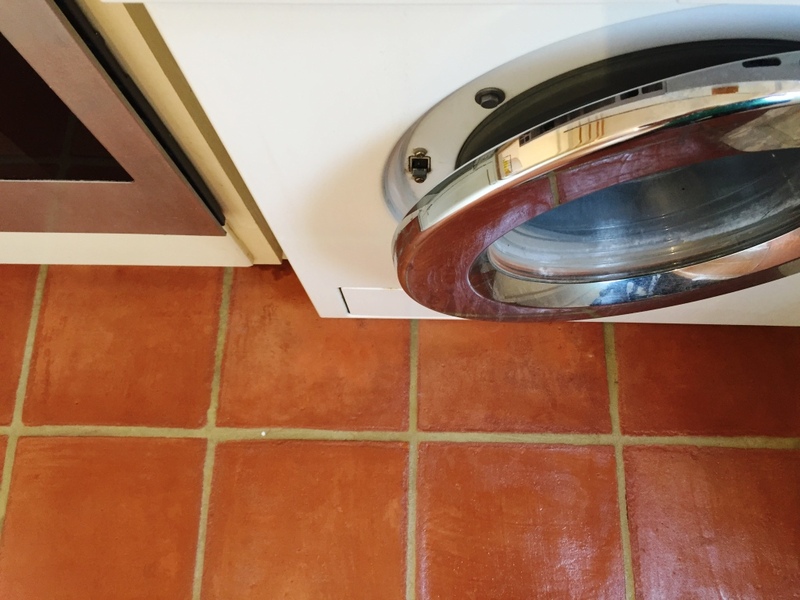 Tile Doctor Seal and Go was used to seal the floor, it’s a water based sealer so it doesn’t give off an odour when it’s drying and also offers durable stain protection together with a satin finish. 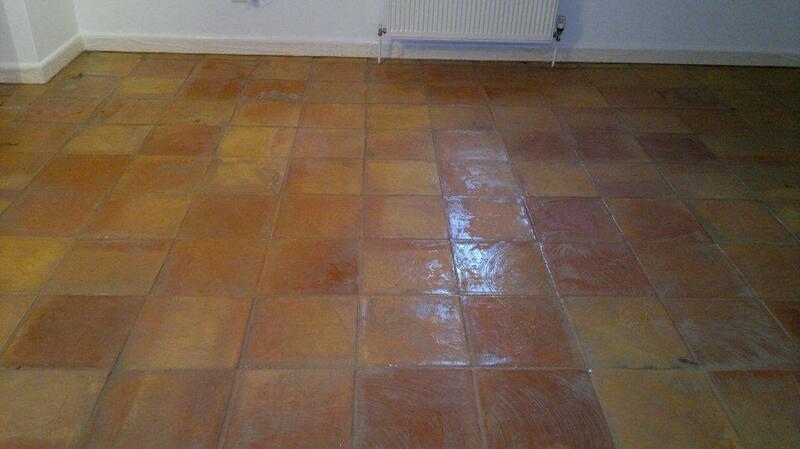 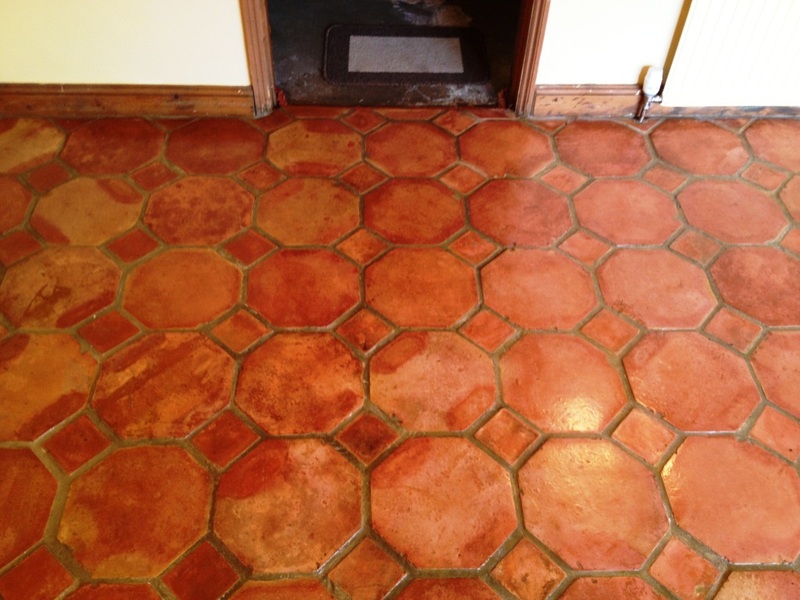 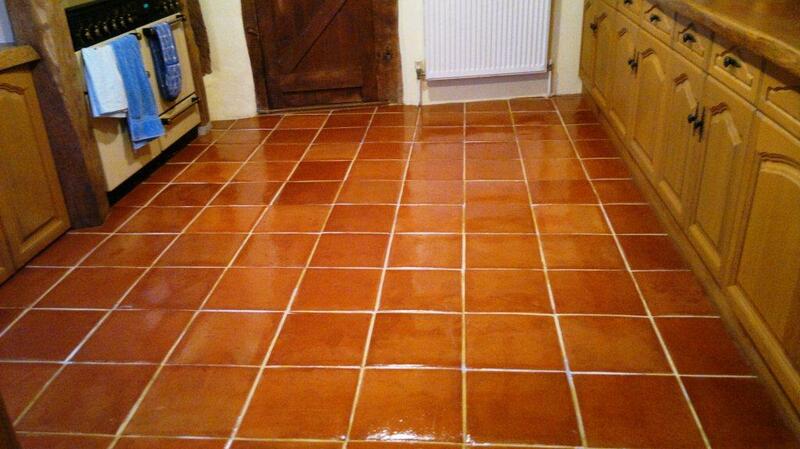 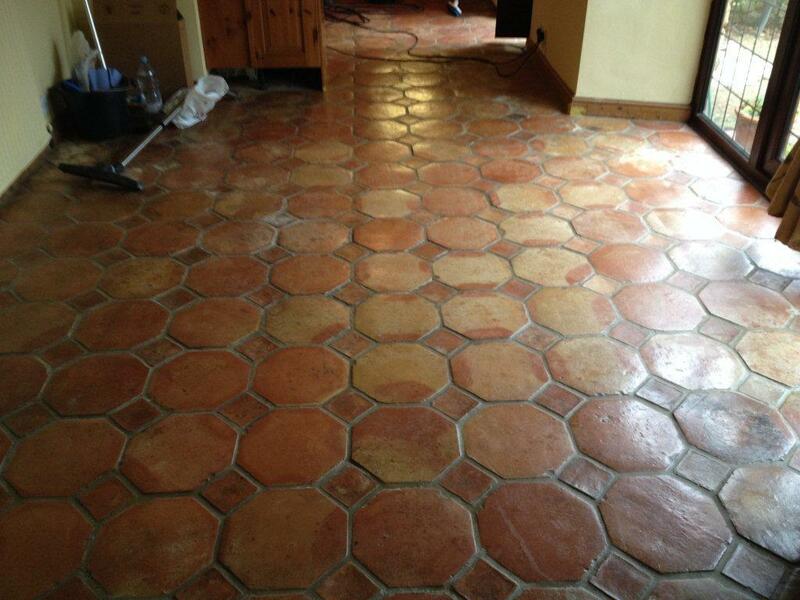 Terracotta is very porous and in the end the floor actually took nine coats of sealer before it was fully sealed. 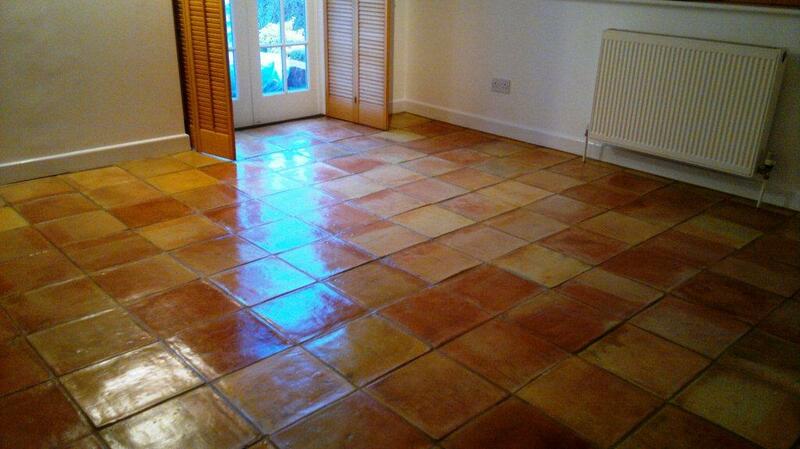 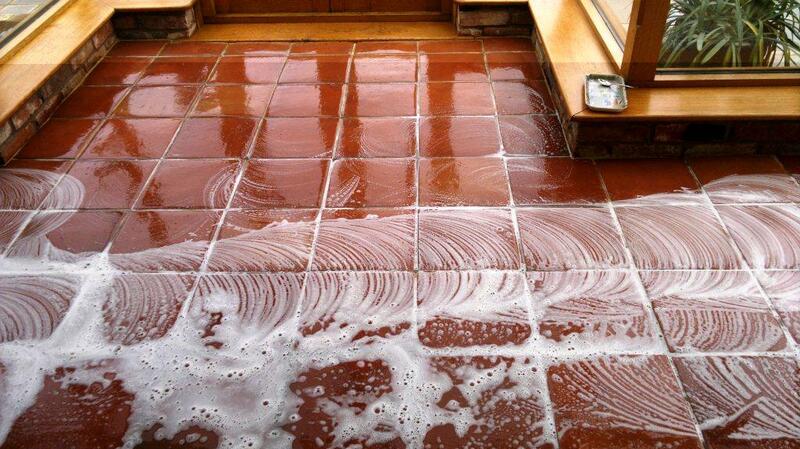 Applying a sealer does takes a long time to apply as you have to wait for it to dry before applying the next coat. 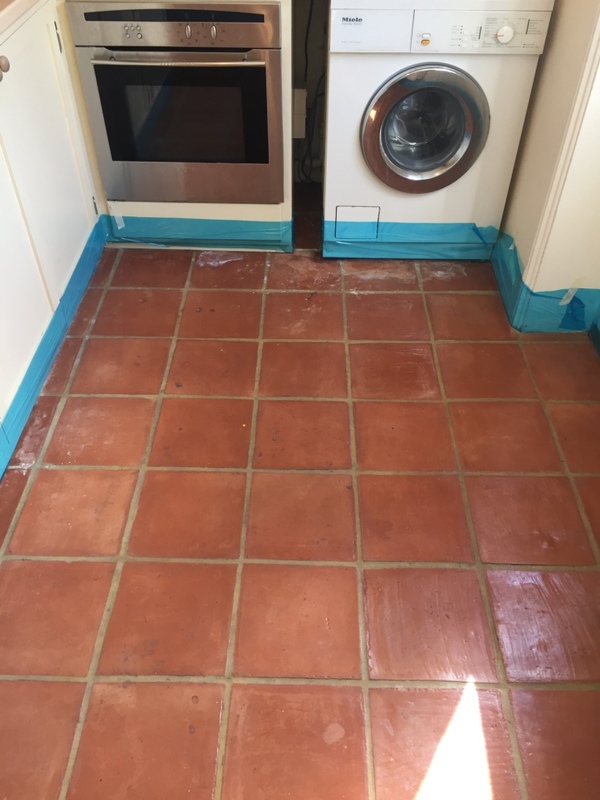 The work took two days in all and you can see the difference for yourself, the floor is much cleaner and will be a lot easier to maintain going forward.